Leh Bazaar 1874: A rare photograph showing the most prominent dry posts of the region that was linking a number of markets surrounding it. Barely a 10-minute drive from Leh market is a Fort that Gulab Singh’s Himachal warrior General Zorawar Singh (1786-1841) built during his campaign to Tibet, Baltistan and Ladakh from 1834 till the Lhasa killed and took his severed head as a war trophy. It houses a museum that, as academic P Stobdan notes “symbolizes the reign of terror unleashed by Singh and his Rajput, Jat and Brahmin recruits” on Ladakh and displays the weaponry that was used to break region’s more than 600 years of sovereign identity. This exceptional fighter whose tales of suppression fill the Ladakhi folklore and that of valour remain at the centre of Dogra pride was governor of Kishtwar for Gulab Singh, the vassal of Sikh durbar at Lahore. As drought impacted Kishtwar coffers, according to Gulab Singh’s biographer, Kripa Ram, the author of Gulbanama, the General led a small army of local fighters through Padder-Zanskar route to enter Kargil (then Purig) in 1834. Money apart, he was keen to show his master his capacity in expanding the Lahore territory. After taking over Kargil, he marched towards Leh but the winters set in. Then, Leh was ruled by Tshespal Namgyal (1808-34), a madcap, and an interestingly lazy character, who would sleep in the day to roam around during nights. 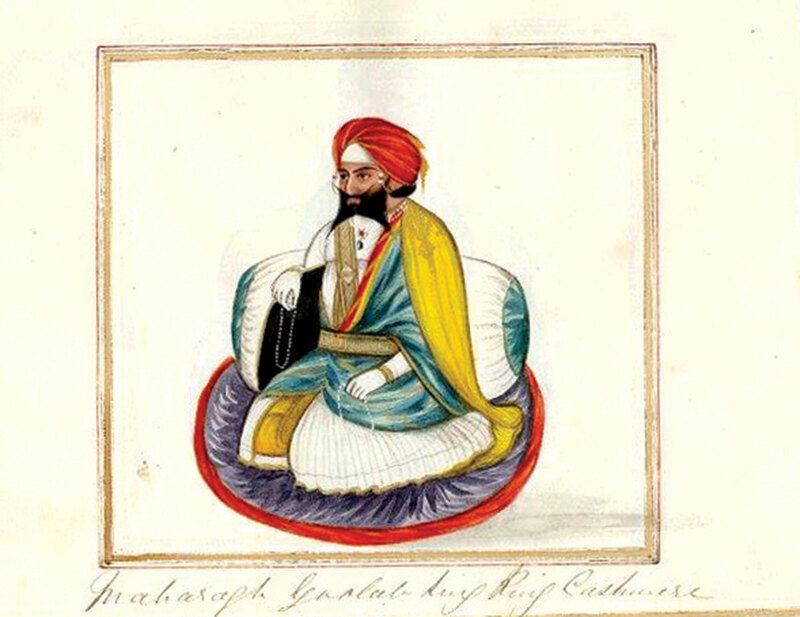 Greedy and wealthy, he avoided reacting to an attack by Padder Raja, then lost part of his Kulu territory, and was later devastated by the Baltistan in 1821. His army had lost the capacity to fight when Zorawar marched, seeking an indemnity of Rs 20,000. The queen counselled him against paying it. The Dogra General protected his army for the winter and took over Ladakh in 1835, deposed Namgyal, literally banished him to Stok after extracting Rs 50,000. In the following six years, the Dogra General had to get into the desert four times more for, either to quell the unrest or to annex the surroundings. He overrun Baltistan and later rushed to Tibet. Before being killed on December 10, 1841, the General implemented the harshest punishment systems, the hallmark of the Dogra regime, to keep the scattered desert population in order. Capital punishment for cow-slaughter apart, cutting noses and ears of people was common. Between 1834 and 1841, British soldier turned archaeologist Alexander Cunningham has mentioned that Ladakh’s Dogra masters killed 15000 residents, as 14000 died of diseases and 9000 fled the desert. Mentioning the tyranny impact, the region’s noted historian Abdul Gani Sheikh has mentioned an incident of Khaltse where the Dogras had put an amputated arm of a rebel on display and his followers had taken it away out of the respect. “The residents cut the arm of a dead resident and replaced the missing part on display to avoid the wrath of the rulers,” he wrote in Ladakh: Tehzeeb-u-Saqafat. But Zorawar’s desert-conquests alarmed the East India Company because it had barely stopped its military campaign against Nepal and wrested some territory. It started pulling the strings on Lahore durbar to halt the campaign. It did not want tensions with Nepal, Tibet and China. But Gulab Singh and Zorawar kept the one-eyed Lahore king in good humour, telling him, his borders are extending fast. The reality, however, was that Gulab Singh, the de facto ruler of Jammu territories, was desperate to control the major trading centre of the region with the focus on Pashmina, the major commodity from Ladakh. Then, Ladakh was a major trade centre. Its Western pass, the Zoji La (La is a pass) linked it with Kashmir; its south-western route linked it with Zanskar, Kishtwar and Jammu through Uamsi La; its southern trek touched Lahul, Kulu, Kangra, Bashahr, Nurpur and parts of Punjab; crossing Hanu La in its north-western side linked Baltistan; from north-western side falls the Karakoram Pass that was Leh’s corridor to Yarkand and Khotan in central Asia; and from south-western side, a long road to Tibet took off. A literal dry port, it was the centre of cross-cultural business, a melting pot. Kashmir would secure its Pashmina wool, salt, tea and many other items from Leh. Besides, Leh would play host to a few hundred faithful from Central Asia on their way to Mecca pilgrimage. In anticipation of Zorawar campaign, there were two interesting developments. East India Company set up a wool-processing unit in Himachal’s Rampur in 1820-21 and demand for the wool had gone up from Amritsar where thousands of Kashmiris, who had fled exploitative Sikh rule, were living. Some exports to the region had started. A Company official created a thick catalogue of the items being sold and purchased in the Leh market with a larger narrative about origins, quantum and the economics involved. It was in 1948 that the Dakota aircraft landed in Leh. The bus came in 1965 war. 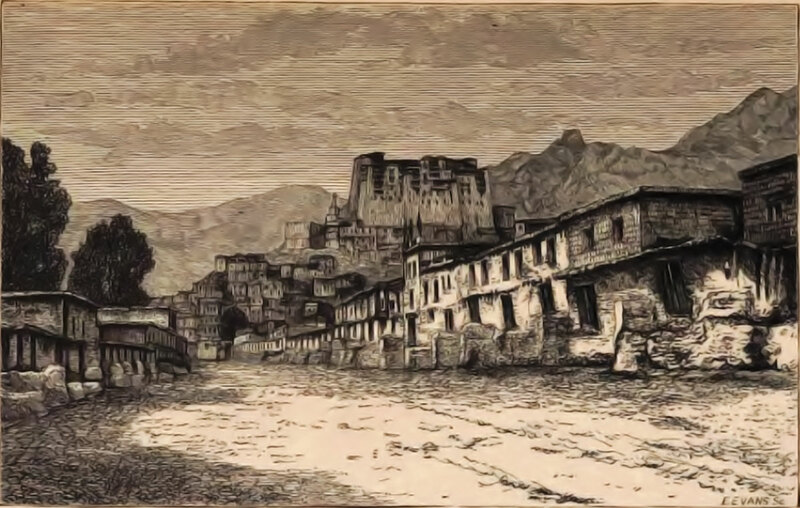 William Moorcroft, another Company official, who has written extensively about the region, stayed in Ladakh for two years until September 1822. He wanted a general trade agreement between Ladakh and the Company. “About 800 loads (wool) are annually exported to Kashmir, to which country, by ancient custom and engagements, the export is exclusively confined, and all attempts to convey it to other countries are punished by confiscation,” Moorcroft wrote. Pashmina being big business, Gulab Singh was angry over the developments and wanted the wool to move out to Jammu through Kishtwar. That was precisely why he supported Zorawar’s campaign. Tragically, however, even after making Ladakh part of his territory, he could not alter the routes of the trade. A year after Zorawar’s killing, on September 17, 1842, Ladakh’s Dogra ruler was sitting with his Tibet counterpart at Chashul to sign a peace treaty in which the neighbours agreed not to disturb the boundaries or the trade. It was the formal declaration about Ladakh losing its independence as Tibet agreed to Dogra annexation of Ladakh on behalf of China and the Lama Guru of Lhasa. Four years later, Gulab Singh purchased Kashmir from the Company and set up the heterogeneous state that had Jammu, Ladakh and Baltistan already part of it. In 1852, Lhasa and Ladakh were again sitting with a Maharaja’s representative to settle trade disputes. But Kashmir’s relations with Ladakh preceded the opium addict greedy warrior’s takeover after the Treaty of Amritsar. Ladakh’s Buddhism owes much to Kashmir than Tibet as Kashmir takes pride in the conversion of Ladakhi prince Rinchan to Islam. The two different agro-climatic regions had centuries of symbiotic co-existence, despite the occasional raids on each other. Throughout its history, Kashmir has remained its major trading partner. Sheikh has mentioned that Ladakh sovereign Jamyang Namgyal (1555-90) actually invited six Kashmiri traders and settled them in Leh. These Argons, Sunni Muslims of Kashmir origin, are still a small Leh community that has historically contributed to the well being of the region. This relation only improved in subsequent years. When the ambitious king Deldan Namgyal (1620-1660) attacked his neighbours, some Rajas sought intervention from the Mughals. To avoid an invasion, Deldan offered his allegiance to Aurangzeb, minted coins and permitted khutba in the latter’s name after constructing Masjid in the main town. Later, when Deleg Namgyal (1660-85) was attacked by Tibet twice, Mughals sent troops from Srinagar under the command of Fida Khan and pushed the assaulters away. This time, however, Mughals extracted a price by way of Treaty of Tingmosgang that was signed in 1684 fall, in a Temisgam castle, some 90 km from Leh. 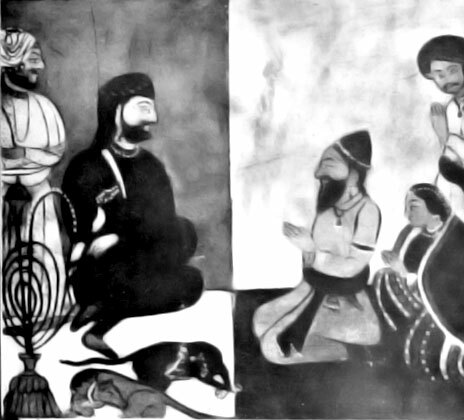 Zorawar Singh in Ladakh: A rare painting showing the Ladakh king surrendering before General Zorawar Singh in 1841. The General was Gulab Singh’s appointee who took the borders of the Lahore durbar to Baltistan and Gilgit. The Treaty put an end to the tripartite conflict involving Tibet, Ladakh and Mughal Kashmir. “One clause of the treaty deals with the Pashm trade between Ladakh, Tibet and Kashmir,” JNU scholar Sonam Joldan mentions in his PhD thesis on Ladakh’s traditional Ties with Buddhist Tibet. The treaty asserts the “the goat wool must not be sold to any other country but Kashmir” at a pre-fixed price, permitted four Kashmiri merchants to be “settled at Spituk” to supply the Pashm to Kashmir and forbade Kashmiri merchants from purchasing the wool directly from the growers. Ladakh resisted all efforts to interrupt the Treaty. After the Company took over India, missions went to the region to seek wool in 1774. But the efforts were resisted and the agreement was strictly enforced. In certain cases, it entailed capital punishment for individuals violating it. But Company was more interested in collecting intelligence about Russian Czars and China rather than collecting the finest wool on earth. After Gulab Singh took over, the Dogra coffers started filling with the massive taxes. The autocrat would impose taxes on imports into Ladakh, then sales and finally when the raw material would get into the finer product, a full-fledged Dagh-e-Shawl department would decide his share. Dogras improved their presence in the region, and a complete Kashmir generation was lost to Begaar – the process of taking provisions on their backs from Srinagar to the Gilgit garrisons. Restive Gilgit was annexed to the state by Ranbir Singh in 1860. Gradually, the generations of Ladakh’s ruling dynasty was rehabilitated and the region was ruled through them. While the region lost its independence, and the inter-plateau trade was hugely taxed, Ladakh retained the spiritual connectivity with Tibet. During his 2004 field survey, Sonam visited seven monasteries and met 96 monks who had read from Tibet, and some of them had spent more than two decades in and around Lhasa, a practice that ceased after Beijing occupied Tibet in 1949. Then, Ladakh had 2545 monks in 26 monasteries. When the 112-year-old exploitation ended with the emergence of India and Pakistan, Ladakh was caught in a serious crisis. Then, part of the Baltistan wazarat, it became a war theatre. Gilgit Scouts overran Dogra army, captured Baltistan, announced independence and joined Pakistan. Parts of Poonch rebelled and created the ‘Azad’ Kashmir comprising Muzaffarabad, Mirpur and parts of erstwhile Poonch principality. Maharaja’s estate was divided between India and Pakistan that eventually led to the first war on Kashmir. By the fall of 1947, Zoji La and Kargil were in control of Pakistani forces, and the ‘intruders’ were very close to Leh. Prithi Chand, a Major rank officer from Himachal risked his life and that of his team and scaled heights and reached Leh on March 8, 1948, 27 days after he left Srinagar. With local help – Ladakh had only 30 soldiers from the Dogra army – they created the basic 2300 yard runway by April 6, almost in 24 days. Sonam Norbu, an engineer, had accompanied them from Srinagar. A long march of the LBA in support of their UT status demand during 1989 agitation. Finally, on May 24, 1948, Air Commodore Mehar Singh, then the top IAF officer in Jammu and Kashmir, flew Major General Thimayya to Leh, in a DC-3 Dakota. This makes Leh slightly distinct as it saw aircraft first and a bus later. Sheikh has recorded the first bus driving into Leh in August 1962, in the wake of Sino Indian conflict. The elders joke around saying that one war brought an aircraft and another drove a bus to Ladakh! By then, Ladakh had shed part of the weight that its location and history had bestowed upon it. The Treaty High Road that linked it with Kashgar through the Karakoram for a millennium was closed in 1949, days after Ladakh was secured from Gilgit Scouts. It retained its Tibet connection for 13 years till the Sino-Indian conflict closed this road in 1962. Prior to that, a lot of refugees from Tibet took shelter in Leh. They are now more than 3500. A rare portrait of Gulab Singh, whose General invaded Ladakh, years before he purchased Kashmir from the East India Company. A similar action took place in remote Leh. On December 13, 1971, Balti villagers in Turtuk slept in Baltistan and the next morning they woke up in India. Turtuk was one of the four villages in a 14-village cluster that Indian army captured and retained. But all these things did not push peace to these frontiers. In 1984, a cartographic crisis between India and Pakistan took the two countries to Siachen glacier, where, an analyst wrote, “two bald men are fighting over a comb”. In 1999, they fought a bloody localised war over the heights in Kargil that led to the setting up of 14 Corps headquarters in Leh. 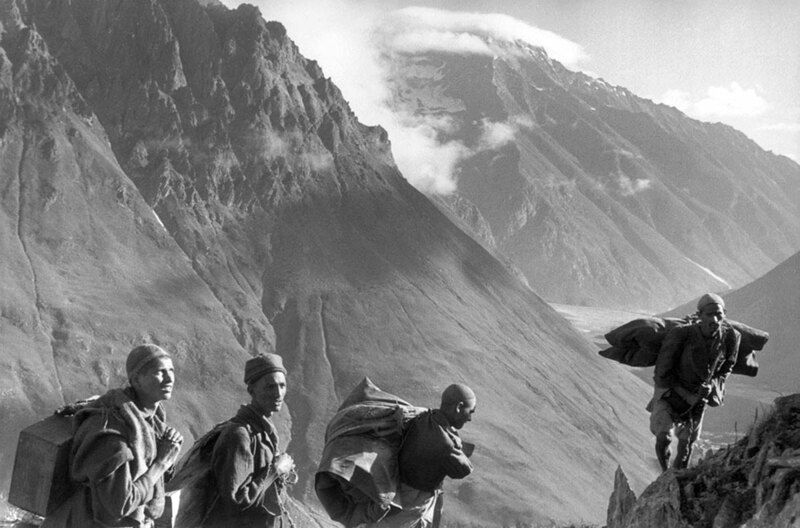 In between the wars, Ladakh enormously changed its growth trajectory. For almost half a century, former education minister Naeem Akhter said, under government orders almost all Kashmiri teachers were supposed to have a two-year stint in the region. “My father was in Kargil for many years and is still remembered,” Akhter said. “A number of generations in Ladakh were either taught by Kashmiris in Ladakh or were educated in Kashmir. It is still going on; though the situation has phenomenally changed now.” Ladakh has a better literacy rate than the rest of the state. Militancy in the 1990s disrupted the cycle and young men and women started going to Jammu for education. Off late, there are tense situations. Last year, thousands of Ladakhi students were on roads in Jammu protesting the deliberate sexual exploitation of its medical students by teachers. Now, Kashmir University has a campus in the region, and recently, the government announced a Cluster University also. While Kashmir University has assigned the examinations to the local controller, there are suggestions that both the universities must be clubbed for better infrastructure and education. The opening of the region for tourism in the seventies was a major game-changer. “Kashmir’s hospitality sector moved to the new destination and deserves credit for setting up the destination, brick by brick,” former Director General Tourism, M Salim Beg said. “It has changed the region’s socio-economic indicator.” In 2018, 327366 visitors including 49477 foreigners flew to Leh. Now it has two 5-star hotels as the footfalls are opening new sectors for growth. Region’s chronic deficit in energy was a huge crisis despite the state-owned power development corporation (SDPC) having nine operational micro power project on silt-rich rivulets. NHPC moved in and built two mid-sized projects at Nimu and Chutak generating 90-MW plus. By the 2018 fall, it is now linked to the national grid by a 335 km Rs 2266 crore transmission line. 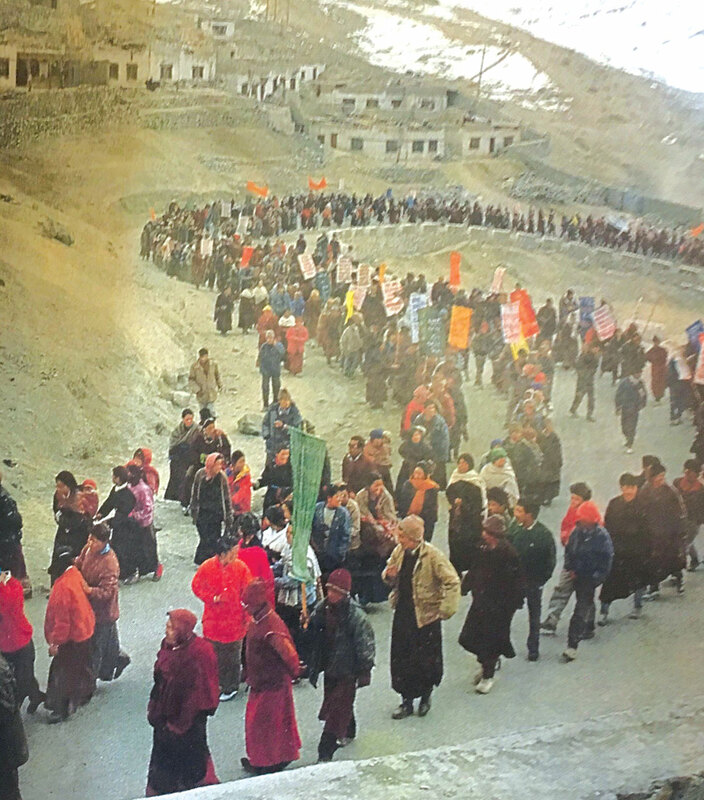 1989 protests by the Ladakh Buddhist Association (LBA) for UT status to the region. Owing to strategic reasons, however, the focus is on improved connectivity within. The 434-km Srinagar-Leh highway is going to have a 14.2 km Rs 6800 crore tunnel bypassing the Zoji La that will make the destination accessible round the year. The arduous, dirty and avalanche-prone alternative, 490 km Manali-Leh road is being refurbished. The latest new road is 148 km connecting Darcha in Lahaul (Himachal Pradesh) to Padum, the Zanskar capital, passing the 16600 ft Shinku La. The Buddhist majority Zanskar is part of Kargil district, though 230 km away. Now Border Roads Organisation (BRO) is taking the same road almost 260 km ahead to connect it with Nimu (Leh), bypassing Kargil. But murmurs in the region indicate the loss of inheritance in lacking the strategic advantage which local roads cannot compensate. Leh is seeking some pact with Beijing to help the region access the route to Mansarovar Lake, the same route that Zorwar Singh took in 1841. A religious spot, pilgrims take a highly dangerous route to the lake from UP. Kargil is quite restive and vocal for restoring its access to Skardu. Every time any VVIP lands in Kargil, the local leaders ensure he drives to the famous Point 43 in Hunderman outskirts on which is the last spot on the road that once was a highway to Skadu, the regional capital. Located on the banks of roaring Shingo River, it is barely 17 meters from Olding, Pakistan’s most forward position. The post was wrested from Pakistan in 1965 but returned post-Tashkent. In 1971, it was re-captured and retained. Kargil is not pushing the restoration of the historic link for trade but for reuniting the families divided by conflict. But eventually, it is the trade that is on the mind. The town is literally sitting on the head of the new trade silk route – the Karakorum Highway linking Pakistan with China and passing through Gilgit. From Kargil to Skardu is 126 km and 100 km more, it joins the Karakorum short of Gilgit. But all this has not prevented the fighting. When armies at the LoC are not fighting, the people in the region are fighting within and with Kashmir! Heterogeneity within the region is a cauldron in itself. Leh and Kargil share geography and ethnicity and nothing else. Kargil got its first primary school in 1901, only sixty years later than Leh. Kashmir leaders say this all is the outcome of the strings being deliberately pulled to score points and pit one region against another. The crisis had an interesting start. On July 7, 1989, when Kashmir was trying to make out what is happening on Srinagar streets, there was a verbal duel between some Buddhist and Muslim youth in Leh bus stand. It took a communal turn and Ladakh Buddhist Association (LBA) led a serious communal campaign. Subsequently, the protesting youth torched the homes and businesses of the minorities, forcing police to resort to firing (August 27) in which three LBA activists were killed. Kashmiri traders were chased out of Leh. In immediate follow-up, the minorities were socially boycotted for 39 months, till November 1992. This agitation saw the rise of demand for Union Territory (UT) status for Leh. The crisis was managed by Dr Farooq Abdullah-led government that agreed, along with its ally Congress, to consider setting up of the Ladakh Autonomous Hill Development Council (LAHDC) for Leh. The then Home Minister, Buta Singh, brokered the deal between Srinagar and Leh and oversaw the signing of a literal peace deal between LBA president Thupstan Chewwang, additional secretary MHA, and additional Chief Secretary, Jammu and Kashmir government. Early 1990, Dr Farooq resigned and the state plunged under governor’s rule. Zoji La 1947: Kashmiri men taking the ammunition to the Indian army posts for fighting with the Pakistani intruders in 1947-48. The Council, however, was agreed by Delhi on October 9, 1993, but announced on August 29, 1995. Dr Abdullah, after his return to power in 1996, ratified the law for LAHDC, already passed by the Lok Sabha, he, however, avoided, empowering it. Congress won the first Council, hands down. Congress government funded region’s most modern Rs 8.25 crore de-hairing plant for Pashmina in 2006. A cooperative society would purchase part of the 40-ton raw wool and process it. It helped improve rates (now Rs 9000 plus a kilogram). The district government also launched Project Laksal that encouraged local women to pick up value addition by spinning, weaving and designing different items. The idea has actually taken off, and now the hand made products are branded and marketed locally. “When Mufti-led PDP Congress replaced NC rule in 2002, the cosmetic LAHDC was fully empowered,” Akhter said. “It was without any conditions because the state government was committed to it, already.” Interestingly, Nawang Rigzin Jora, who was the most known face of 1989 fires, was part of the cabinet. It is in this backdrop that the governor Satya Pal Malik announced the elevation of the region as state’s new administrative and revenue head. The decision that was under consideration of the government was welcomed by all including NC and PDP, the two unionist parties with a major support base in Kashmir. Their only problem was that Kargil should not be discriminated against and the Governor agreed to it. Now the divisional offices will shuttle between Leh and Kargil. But the larger narrative behind the abrupt elevation is seen as political. BJP is keen to retain its influence in the region that was dented after its MP, who had won by a slender margin, resigned from the party and the post. There are two political aspects linked to the debate. Firstly, if at all, the decision is an indication towards the trifurcation of the state. Secondly, if at all, the decision has anything to do with the Musharaf formula that wanted identification and recognition of diverse sub-regions existing across the erstwhile state. Pakistan has already given a lot of autonomy to the Gilgit Baltistan belt after decades of being managed by an officer in Islamabad. Every new visitor to Leh is being recommended the book Ancient Futures: Lessons from Ladakh for a Globalizing World. Authored by German academic Helena Norberg-Hodge, the book explains the traditional solutions to complex modern problems. Is Ladakh’s provincial status, one such solution to one major crisis?